birthday and it should be his present. The squabble turns into a fight and Sméagol strangles his friend with his bare hands to finally prise the Ring from his clenched fist. We are then shown how Sméagol was ostracised from his community and driven away. Suffering terribly from his loneliness and shame, Sméagol takes solice in his love for the Ring as it slowly tortures his mind. His hardships in the Mountains twist his shape into that of Gollum. As the flashback ends, we are taken back to the present where, on the outskirts of Mordor, Frodo and Sam are resting in an alcove. Sam awakes and sees that his master has not slept, the days are also growing darker the closer they get to Minas Morgul and Mordor. Gollum arrives and urges them to move on. 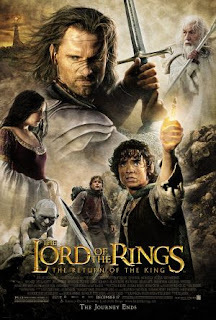 Away in the west, Aragorn, Legolas, Gimli, Gandalf, Théoden and Éomer are riding through Fangorn to Isengard, where they meet Merry and Pippin feasting among the wreckage of Isengard. They then go and see Treebeard at the Orthanc where Saruman has been trapped. Gandalf opposes Gimli's call to kill Saruman, saying that the wizard has no power any more and will pose no further threat. As they are talking, Pippin sees the palantír amongst the flotsam and is enamoured by it, but Gandalf quickly asks it from him and hides in under his cloak. in what his heart tells him, that Frodo is still alive. Gollum awakes in the night as Frodo and Sam are sleeping and goes off to one side to murmur to himself. necessary for their quest. Sam obliges as Gollum flashes him an evil smile while Frodo's back is turned. White Tree, Gandalf deduces that Sauron is now moving to attack Minas Tirith and he rides off to send warning, taking Pippin with him, lest his urge to look upon the palantir (left now in Aragorn's keeping) return again. Leaving Rivendell on her way to the Undying Lands, Arwen has a vision of her son by Aragorn, she realises that her father lied to her about there being no chance of a future with him whom she loves. She returns to Rivendell and convinces Elrond that she, having foresaken the life of the Eldar, cannot leave Aragorn now. She tells her father that as was declared in lore, the time to reforge Narsil has come, Narsil being the sword of Elendil that cut the Ring from Sauron's finger long ago at the end of the Second Age. Gandalf and Pippin arrive at Minas Tirith, City of Kings, that was built out of the rock of Mindolluin. There Pippin recognises the White Tree as they go to find the Steward Denethor. They approach him mourning over Boromir, his son. Pippin swears loyalty to him in recompense for Boromir's sacrifice. Denethor seems to be caught up in his grief and has not taken measures to fortify the city against the threat of Sauron. Meanwhile, Frodo, Sam and Gollum arrive at Minas Morgul. Wary of the enemy, they locate the Winding Stair (leading to the pass of Cirith Ungol) that lies hidden in the cliffs surrounding the accursed city. Just at that moment, the doors of the city open and the Witch-king of Angmar, leader of the Nazgûl, dispatches his immense Orc army from his lair, heralding the start of the war. This is witnessed by Gandalf and Pippin as a flash of lightning shoots up at the opening of the doors. At the urging of Gandalf, Pippin lights the first of the beacon signals to Edoras, alerting Théoden, Aragorn and the rest of the Rohirrim to ride to the weapon-take at Dunharrow and thence to Minas Tirith. As they leave Edoras, Aragorn notices that Éowyn saddles up with them and that she is girt with a sword, but she insists that she rides only to see them off and that the men have found their captain in Aragorn. the dangerous route Gollum is taking Frodo and Sam on, convincing Gandalf of Gollum's treachery. The hobbits, lead by Gollum, are struggling to climb the extremely steep stairs, Gollum reaches out and empathises with Frodo, saying that he understands his pain, and also poisoning him against Sam, saying that he will try and take the Ring from Frodo. In the captured Osgiliath, the Witch-king orders his captain to "send forth all legions" and annihilate the population of Minas Tirith, saying that he himself will "break" the wizard Gandalf. Denethor, ill-pleased by Faramir's defence of Osgiliath, manipulates him into taking a doomed ride to reclaim the city. Gollum continues to play the hobbits against each other, this time by blaming Sam for eating their food provisions. Frodo, in his deluded state, is suspicious of Sam and orders him back home when Sam, trying to be helpful, offers to carry the Ring, thereby fulfilling Gollum's cunning prediction. and Gimli. As he is preparing too go, a tearful Éowyn comes to Aragorn and begs him not to go, declaring her love for him, but Aragorn, knowing now that Arwen has refused promise of Valinor, likewise refuses Éowyn's love. The next morning, Théoden rides off to war with six thousand riders, unaware that Éowyn and Merry, who were both told to remain behind by the King, are also part of his army. and exhaustion. Down in the city, the battle goes ill with the Gondorians, as Grond shatters through the gates of the city and trolls pour in. The defenders retreat to the upper levels of the city, the orcs crawl all over the streets, looting, burning and massacering the men of Gondor. But suddenly in the midst of the chaos a lone horn penetrates the air and all turn to the west and see the army of Rohan arrive at last, to the rising of the sun. The Rohirrim charge into the Orcs with great effect. However their joy is cut short by the arrival of the forces of Harad and the immense Mûmakil. The Witch-king descends on Théoden, killing Snowmane his horse and fatally wounding the King. Seemingly in the nick of time, the Corsairs ships arrive to help the stranded Orcs, but it is Aragorn who jumps off the ship followed by the Undead Army and they completely destroy the Orcs and Mûmakil, while Éowyn and Merry kill the Witch-king. Théoden dies of his wounds and Aragorn holds the Dead Army's oath fulfilled, releasing them from their curse so that they may rest in peace. Barad-dûr collapses, Sauron's essence fades and then explodes, forever banishing his power. The Orcs, Ringwraiths and the remaining forces of Sauron are consumed in the ensuing shockwave as the earth collapses under their feet. Frodo and Sam are stranded as Mount Doom erupts. They voice their regrets at not being able to see the Shire again amidst the torrents of lava and the destruction of Barad-dur. With the destruction of the Nazgul, Gandalf is able to call upon the Eagles to carry the hobbits to safety, they awake in Minas Tirith, reuniting with the other members of the fellowship, all of them having survived the War of the Ring. Aragorn is crowned King of the West, heralding the new age of peace, and is reunited with Arwen. The hobbits return to the Shire, where Sam marries Rosie Cotton. Frodo, having finished writing his entry in the Red Book of Westmarch, is still suffering from the effects of the ring, having possessed it for so long. He realises that he will never have peace in Middle-earth. So he decides to go with Gandalf, Bilbo, Elrond and Galadriel to the Grey Havens. There he passes the Red Book onto Sam to record the years of his life to come, and thence the last ship to leave Middle-earth sets off, pulling slowly away from the shore and passing along the Straight Road into the Uttermost West. Pippin and Merry take their leave and Sam is left staring into the golden sunset. In the last scene, Sam is shown walking back up the lane to Bag End, where he is greeted by Rosie his wife and his children, surrounded by his family and with the rest of his life ahead of him, Sam sighs and says "Well, I'm back", then he goes inside and shuts the door as the screen fades to black.